The Builders Merchants Federation (BMF) has hosted a fact-finding visit for a number of its European counterpart trade bodies, with guests from Belgium, Spain, Portugal and several merchants from the Iberian Peninsula visiting the UK. Their trip was part of an initiative to promote wider understanding and best practice between builders’ merchants across Europe, during BMF CEO John Newcomb’s term as President of UFEMAT (the European Association of National Builders’ Merchants Associations and Manufacturers). Representatives from eight European organisations took part in a three day field trip hosted by BMF Chairman Peter Hindle MBE, John Newcomb and the BMF’s Event Manager, June Upton. Delegates were briefed on the UK market during a visit to the BMF’s HQ in Coventry before attending the Roofing Cladding and Insulation (RCI) Show at Ricoh Arena. 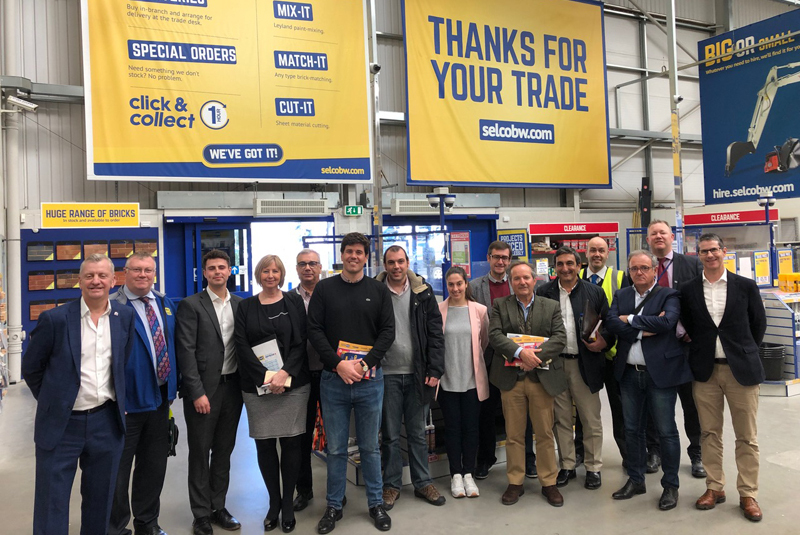 The group also visited branches of two merchants, Selco Builders Warehouse and EH Smith, where they were able to hear directly from the branch managers and directors of both operations about the opportunities and challenges faced by UK merchants, and the business models they have adopted. The BMF has now been invited to speak at the Congress of the National Association of Distributors of Ceramics and Construction Materials in Spain later this year, to share best practice with a wider audience of their members.